I am a big fan of fruity desserts. That is why I made these Blueberry Crumb Bars. These Blueberry Crumb Bars are actually healthy enough for breakfast too. They didn’t last long at our house! I made these healthy crumb bars oil free too. We are currently staying at my inlaw’s house as our kitchen gets renovated. I can tell you that everyone in the house enjoyed these crumb bars. If you like fruit bars, you may also enjoy my Homemade Nutri-grain Bars or my Homemade Fig Newtons. I went a little overboard on the jelly, so mine is oozing out the sides. I recommend not spreading the jelly all the way to the end. Leave about a 1 inch boarder because the jam will spread. These were still delicious though. In addition to being oil free, these bars are also gluten free and vegan. 🙂 This recipe was adapted from my Pumpkin Raspberry Oat Bars. 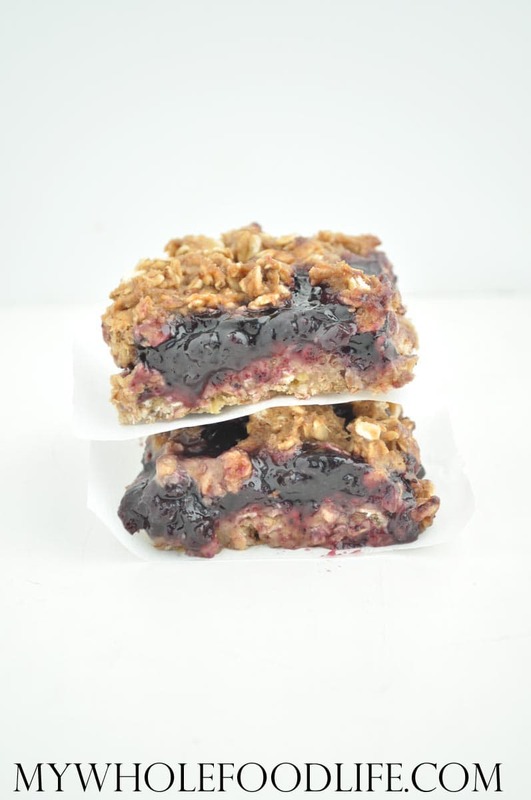 Delicious Blueberry Crumb Bars that are healthy enough for breakfast! Add dry to wet and mix until combined. I just used a spatula for this. Line an 8x8 glass baking dish with parchment paper. Leave enough paper to stick out the sides. Put 1/2 the mixture into the bottom of the baking dish. Lastly, sprinkle the remaining mixture on top. Let the bars completely cool before removing from the baking dish. Store in an airtight container in the fridge. These should last a couple weeks. Enjoy! Can you sub Whole Wheat White Flour for the Oat Flour? What can I substitute the applesauce for? Living in Japan we can't get applesauce. Plain yogurt, oil or banana? Hi Melissa, I've made lots of your recipes and love them, but I wonder if there was an error in the Blueberry Crumb Bars. Them batter was very wet and certainly did not "sprinkle" over the top. The bars baked and cut well after being in the frig over night, but are very heavy and wet, not a crumb in sight! Was the 1-1/2 cups of apple sauce too much? Thanks for checking on this. Hi Cindy! I am so sorry you had an issue with the recipe. :( I can tell you that there is not a typo. I have made this several times without any problems as have many other readers.